The New York Giants had a 9-3 record as they hosted the Philadelphia Eagles, who were just a game behind in the NFC East at 8-4, on December 3, 1989. The Eagles, coached by the brash and defense-minded Buddy Ryan, were the defending division champions and had won the last three meetings between the clubs, including earlier in the season at Philadelphia. QB Randall Cunningham was the key to the offense, and while having a rather ordinary year by his standards, was still formidable both throwing and running with the ball. The loss of star WR Mike Quick left the team lacking a deep threat although TE Keith Jackson was an outstanding receiver. The tough defense, anchored by DE Reggie White, was adept at both rushing opposing passers and forcing turnovers. The loss of punter John Teltschik to a knee injury caused the team to sign Max Runager, whose leg was no longer as strong as when he had been with the club at the beginning of his pro career, but Cunningham, who averaged 45.2 yards as a punter in college, could boot the ball a long way in a pinch, although he lacked proper technique. New York, under the guidance of Head Coach Bill Parcells for the seventh year, also fielded a tough defense led by LB Lawrence Taylor, who was playing with a bad ankle (and only made it through the first half against the Eagles). The conservative offense was directed by gritty QB Phil Simms while 32-year-old RB Ottis Anderson, once a star with the Cardinals, had resurrected his career. There were 74,809 fans in attendance at Giants Stadium on a bitterly cold day in the New Jersey Meadowlands with temperatures in the teens and a wind chill factor that was below zero due to the 35 mph gusts. Anticipating a defensive struggle on a windy day, the Eagles won the toss and chose to kick. On New York’s third offensive play, Phil Simms fumbled when hit by Reggie White and CB William Frizzell recovered, returned it 12 yards, and, about to be tackled by RB Dave Meggett, lateraled to SS Andre Waters, who covered the remaining three yards for a touchdown. Roger Ruzek added the extra point and Philadelphia had the early 7-0 lead. The Giants moved effectively on their next series. Ottis Anderson carried six straight times for 32 yards that included a long gain of 17 yards, but the drive stalled at the Philadelphia 30 and Bjorn Nittmo was short on a 47-yard field goal attempt. The Eagles had to punt following a short possession and the defense again came up with a big play when DE Clyde Simmons intercepted a short Simms pass and returned it 60 yards for a TD. Ruzek again converted and the visitors were ahead by 14-0 thanks to the two turnovers. Now in a two-touchdown hole, the Giants came back with a 70-yard drive in six plays. 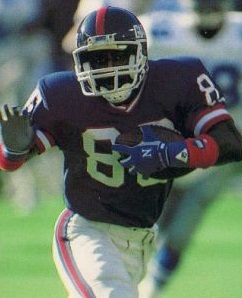 Simms threw to WR Lionel Manuel (pictured below) for a 24-yard gain in a third-and-seven situation and another completion to WR Mark Ingram resulted in a 41-yard touchdown. Nittmo added the point after and the Philadelphia lead was cut to 14-7. With time running down in the first quarter, the Eagles advanced into New York territory. Randall Cunningham threw passes to Keith Jackson for 29 yards and WR Ron Johnson for 31 to reach the Giants’ 29. However, two penalties backed them up and, on the first play of the second quarter, Max Runager’s punt pinned the Giants back at their seven yard line. New York had to punt in turn and Sean Landeta’s 53-yard boot went out of bounds at the Philadelphia 37. The Eagles again advanced into enemy territory, with a Cunningham throw to Jackson picking up 23 yards, but Cunningham’s next pass was picked off by LB Pepper Johnson. However, the Giants were penalized for holding on their first offensive play, negating a 23-yard pass completion, and two plays later CB Eric Allen intercepted a Simms throw and returned it to the New York 30. The Eagles kept the ball on the ground and Ruzek kicked a 35-yard field goal that made the score 17-7. The Giants reached the Philadelphia 42 but had to turn the ball over on downs after failing to convert a fourth-and-11 play. They got the ball back shortly thereafter when Jackson fumbled after catching a short pass that Pepper Johnson recovered at the New York 29. It looked promising for the home team when, five plays later, Simms connected with Manuel for a 49-yard gain that had yardage added on due to an illegal head slap on the defense to put the ball on the Philadelphia 16. But on the next play, Dave Meggett fumbled and LB Byron Evans recovered for the Eagles. The clock was down to 1:47 remaining in the first half and the visitors ran it out to go into halftime maintaining a ten-point lead. The Giants had the ball first in the third quarter and drove 37 yards in six plays, helped along by two penalties on the Eagles, one of which negated an interception. Simms again threw to Manuel for a big gain, picking up 39 yards to the Philadelphia 23. Facing third-and-five at the 13, Simms was sacked by FS Wes Hopkins for a loss of seven yards, but New York added three more points on a 38-yard Nittmo field goal to narrow the score to 17-10. The Eagles moved effectively in response with FB Anthony Toney and RB Keith Byars handling the running load and Cunningham completing passes to Jackson for 33 yards and Byars for 10. 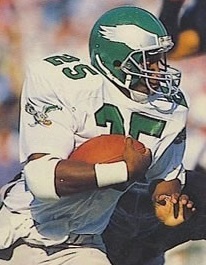 After an 11-yard carry by Toney gave Philadelphia first-and-goal at the New York six, Byars ran for five yards up the middle, but three consecutive carries by Toney were stopped short of the end zone and the visitors turned the ball over on downs. The Giants could get no further than a yard on offense, but were helped out by an offsides penalty on the Eagles and Landeta boomed a 71-yard punt. Philadelphia managed only a short series before punting, and Runager’s kick traveled only 21 yards to give the Giants possession at the Eagles’ 49. 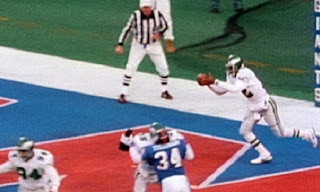 Simms immediately threw to TE Zeke Mowatt for 29 yards and, after two more passes fell incomplete, he connected with Ingram for 14 yards on a third-and-10 play to the Philadelphia six. A pass interference call moved the ball to the one and Anderson scored a touchdown from there. Nittmo kicked the extra point and the score was tied at 17-17. The Eagles punted from deep in their own territory following the next possession and Runager’s 37-yard kick was returned 10 yards by Meggett to the Philadelphia 39. Simms threw to Meggett for seven yards to finish off the period but a tripping penalty moved the Giants back ten yards and DT Mike Pitts sacked Simms for a nine-yard loss. A third down pass was incomplete and New York was forced to punt, with Landeta’s 26-yard boot downed at the Philadelphia 25. After an incompletion on first down, a holding penalty moved the Eagles back ten yards, a toss to Byars lost another three, and Cunningham was sacked on third down by NT Erik Howard. It looked good for the Giants as Philadelphia was forced to punt from its own end zone. But this time it was Cunningham back to punt, rather than Runager (pictured at top). His wind-aided kick went 70 yards in the air and bounced past Meggett, who finally chased it down after it had traveled 91 yards in all. Meggett returned it nine yards, but instead of having favorable field position in Philadelphia territory, the Giants were back at their 16 and facing the wind. New York was penalized for an illegal formation on first down and on the next play Simms fumbled when sacked by DT Mike Golic and Pitts recovered at the New York seven. Three plays later, Byars ran for a two-yard touchdown and, with Ruzek adding the point after, the Eagles were back in front by seven points. There were still nearly 11 minutes left to play and the Giants drove into Philadelphia territory. Simms converted a third-and-four play with a completion to Meggett for 11 yards and a pass interference penalty on Waters gained 21 yards. But the advance was halted at the Philadelphia 30 and a fourth-and-seven pass by Simms intended for Ingram was incomplete. The Eagles were able to run significant time off the clock as Byars ran six straight times, including a 15-yard gain on a draw play when facing third-and-eight. By the time they had to punt, there was only a little over a minute remaining in regulation. However, a bad snap over Runager’s head had the punter recovering at the Philadelphia 46, from where the Giants had possession with 1:04 left. Simms threw to Manuel for 14 yards, but his next four throws fell incomplete and the Eagles came away with a hard-fought 24-17 win. New York had the edge in total yards (294 to 279) and first downs (17 to 13). However, the Giants also turned the ball over five times and all of Philadelphia’s points came off of New York turnovers. The Eagles turned the ball over twice but were penalized 16 times at a cost of 111 yards, to six flags thrown on the Giants. Philadelphia recorded five sacks, to one by New York. Randall Cunningham completed 9 of 16 passes for 140 yards with no touchdowns and one interception, ran the ball five times for 10 yards, and of course booted the 91-yard punt. Keith Jackson topped the Philadelphia receivers with 5 catches for 97 yards. Anthony Toney (pictured at left) rushed for 68 yards on 22 carries and Keith Byars contributed 66 yards and a TD on his 14 attempts plus three pass receptions for 12 yards. For the Giants, Phil Simms was successful on just 11 of 37 throws for 265 yards and a TD with two intercepted. Lionel Manuel had a big day with four receptions for 126 yards while Mark Ingram gained 83 yards on his three catches that included a touchdown. Ottis Anderson ran for 46 yards on 16 carries and scored a TD. The Eagles drew even with the Giants at 9-4 while holding the tiebreaker due to having now swept the season series. However, they lost one of their three remaining games while New York won all of theirs and thus the Giants topped the AFC East with a 12-4 record and Philadelphia settled for second place and a wild card slot at 11-5. Both teams lost to the Los Angeles Rams in the postseason, the Eagles in the Wild Card playoff and the Giants in the Divisional round. Randall Cunningham punted 20 times over the course of his 16-year NFL career, averaging 44.7 yards. 12 of those punts, for a 51.7-yard average, came with the Eagles, with the 91-yard kick against the Giants the longest and most memorable. It remains a franchise record, by a full eight yards.